In Gmail you can send and receive Attachment up to 25 megabytes (MB) in size. And all of us using that service most of the time to send a file or doc to our friend via attachment. In Gmail it has limitation that you can’t send a file above 25 MB size as an attachment. Thanks to Attachments.me Addon for Firefox and Chrome which allows you to send big files upto 100MB as a attachment form your GMail account. To use this service you don’t have to pay any amount. it’s totally free. All you have a free Dropbox. Google drive or Box account and Attachment.me addon. So next time with this addon you can send a big file to your friends without any hassle. As we mention above to use this service you have sign up for a free account of any of these cloud service Dropbox, Google Drive or Box. Below is the step by step guide which helps you to send big attachment from GMail. 1. Install the Attachment.me Addon from here to your Chrome or Firefox Browser, Here we are using the Chrome Browser to use this addon. 2. Now login to you Gmail account, which you want to use to send big file. 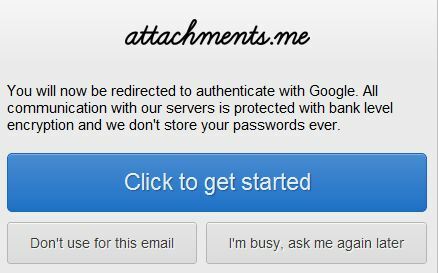 At your Gmail inbox page you will get the pop message from Attachment.me to activate the Addon, hit the Get Started Option to activate the addon. 3. Now Choose the cloud service from the window, which you are using. Here we choose the Dropbox Account to activate Attachment.me. 4. 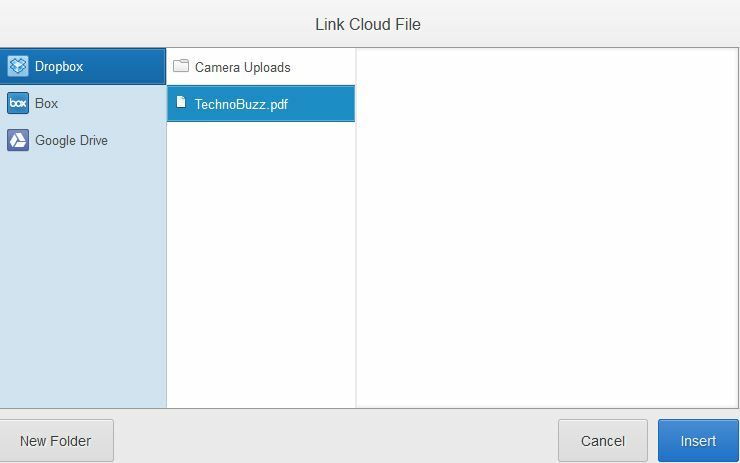 After Choosing the Cloud service it will ask you to Link the Cloud service to your Gmail Account, follow the process and link your Cloud account with Gmail to use this Addon. 5. Now You can see the the new Attach a file icon on your Gmail Compose box, to attach a file on your Gmail first Upload that file on your Cloud account and after that click the Share from Dropbox icon to attach that big file on your Gmail Attachment. 6. Now you can see the new Pop window of your Dropbox account on your screen, from here select the file which you want to add as a attachment and hit the Insert Button. 7. Now the file is attached on your Gmail Compose message and the link will be inserted in the e-mail body. That’s it now you are ready to send that big file as a attachment from your Gmail inbox. The Attachment.me is great addon to send big file up to 100MB from your Gmail inbox and it’s totally free to use and available for both Firefox and Google Chrome Browser.